Michelle Belcher’s 2012 Kia Soul. Concern about the risk for Hyundai and Kia vehicles to catch fire has spread recently, with no official recall yet. 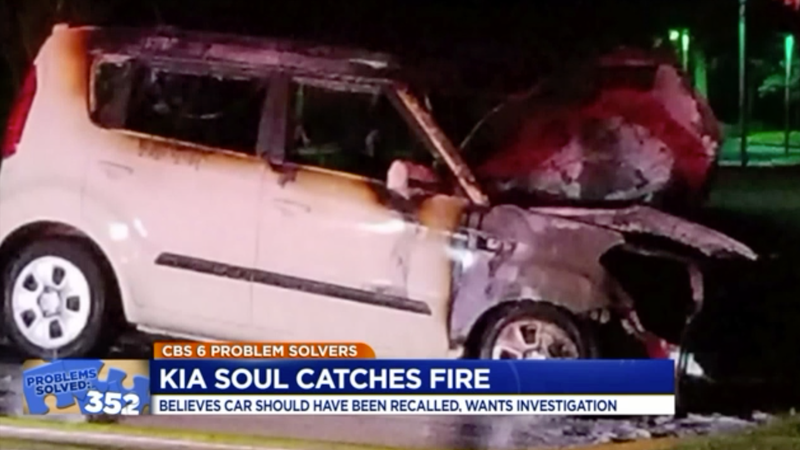 One Virginia woman wants to hurry that process along, since she said she’s still on the hook for payments on her 2012 Kia Soul that burned to a skeleton of its former self earlier this month. Richmond, Virginia news station WTVR reported that Bailey Belcher, 19, was driving home from work in a Soul owned by his mother when he noticed smoke and pulled over. Belcher said he saw a fire after he pulled over, and that the “whole car went up in flames” in about five minutes. Belcher said that having a full warranty didn’t matter and she just learned that her insurance is only paying half of what she owes on the car. For now, she still on the hook for monthly car payments for at least the next three years on a car that she can no longer use. Michelle Belcher didn’t expand on the “full warranty” mention in the story, but Kia models have a five-year, 60,000-mile basic limited warranty and a 10-year, 100,000-mile powertrain warranty from the time of purchase. Five years from the time of the fire would have been July 2013, so it’s possible but not likely that a 2012 model year was under the standard factory warranty. The Center for Auto Safety advocacy group petitioned the U.S. National Highway Traffic Safety Administration to investigate claims of fires in certain Hyundai and Kia vehicles in June, saying at the time at least 120 owners reported their cars catching fire without prior collision and that 229 reported “melted wires in the engine bay, smoke, and burning odors, indicating potential fires.” The cars included in the complaints were Optima, Sorento, Sonata, or Santa Fe models between the 2011 and 2014 model years. Michelle Belcher’s car was a 2012 Kia Soul, which wasn’t on the group’s original list. That means it could have been a separate or even isolated issue, but there was another recent report of a 2014 Soul catching fire. The driver of the car said she was on the freeway in Texas when another driver saw flames under her car, NBC DFW reported. When asked about the status of the NHTSA’s investigation into the other models the center petitioned about, an NHTSA spokesperson didn’t directly address the timeline. Jalopnik also asked the spokesperson whether any Kia Souls, particularly 2012 or 2014 models, have been added to the investigation since that original petition. We’ll update this story if we hear back. Whether it’s related or unrelated to the issue that may be a fire risk in the other Kia and Hyundai cars, Michelle Belcher told WTVR she hopes Kia looks into the issue because she doesn’t want this to happen to others. Update: July 24, 2018 6:25 p.m. ET: The Center for Auto Safety added the 2010 to 2015 Kia Souls to its petition in addendum you can read here.